This comprehensive study analyzes growth of cycling and NYC’s bicycle network, noting that as the number of regular bicyclists has increased, cycling has grown dramatically safer. Created in cooperation with agency partners at the New York City Police Department (NYPD) and the Department of Health and Mental Hygiene (NYC DOHMH), the study describes the progress New York City has made in improving cyclist safety, presents a detailed analysis of the factors that contribute to serious crashes involving cyclists, and lays out a comprehensive action plan to further improve cycling safety. Cyclist fatalities and severe injuries resulting from crashes with motor vehicles were analyzed, employing cyclist fatality data from 1996 through 2016 and cyclist killed and severely injured (KSI) data from 1996 through 2014. The growing number of cyclists on our streets is a likely contributor to the positive changes in cycling safety. Researchers in the field of traffic safety posit that the more cyclists there are on the road, the safer riding becomes for all cyclists. The correlation between the rise in cycling and the drop in cyclist fatalities and cyclist KSI per bicycle trip suggests that this “safety in numbers” dynamic may be occurring in New York City. The launch of Citi Bike coincided with a drop in cyclist KSI within the bike share area. Cyclist KSI declined by 17% within the bike share zone after one year of operation, despite a recorded 8.2 million bike share trips in the first year of operation. The vast majority of cyclist fatalities occur on streets without bicycle facilities. Between 2006 and 2016, only 11% of cyclist fatalities occurred on streets with a bicycle facility. A number of New York City neighborhoods underserved by the bicycle network experience significant cyclist KSI. 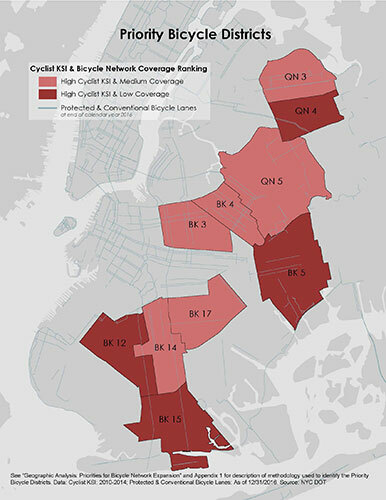 NYC DOT identified 10 Priority Bicycle Districts, neighborhoods with comparatively high numbers of cyclist KSI—suggesting significant bicycle ridership—and few dedicated bicycle facilities. These districts, seven in Brooklyn and three in Queens, represent 14% of the City’s bicycle lane network and 23% of cyclist KSI. Moving forward, the agency will prioritize these areas for bicycle network expansion. The overwhelming majority of cyclist fatalities and cyclist KSI occurred at intersections. The majority of cyclist fatalities (65%) and an even greater percentage of cyclist KSI (89%) occurred at intersections. NYC DOT is undertaking a study, to be released in early 2018, to examine the safety impacts of different intersection designs and make recommendations for new design treatments. Most crashes leading to cyclist fatalities fall into three main categories. The top three crash types resulting in a cyclist fatality were: traveling adjacent to a motor vehicle (29%), traveling at a right angle to a motor vehicle (27%), and motor vehicle turn crashes (21%). A high percentage of cyclist fatalities (27%) involved trucks, when compared to cyclist KSI (5%). 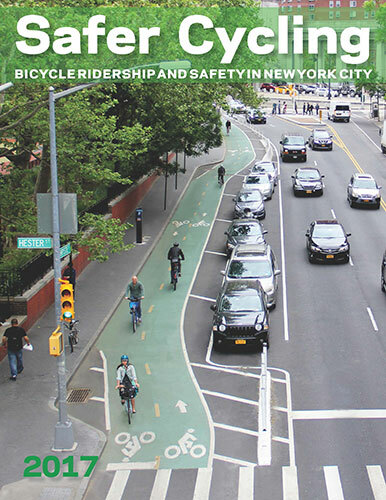 Based on these findings, the 2017 Study recommends a comprehensive set of engineering and planning, enforcement, education, policy and legislation, and research and data strategies to improve cyclist safety across New York City.